IFTN caught up with screenwriter Lindsay Sedgwick to talk about her new book 'Write that Script', the first of it's kind to be written and published in Ireland. Lindsay has taught screenwriting since 1996 to students at every level from post-grad to undergraduate, from adults to children; from courses on advanced screenwriting to beginner level. She has also developed workshops on visual storytelling, on creating characters and developing series and provides script and project consultancy for individuals and companies. She was a reader for BBC NI for many years. She has taught at Maynooth, DCU and UCC, Filmbase, Liberties College, plus various libraries in Dublin and Kildare. She has given Masterclasses at a range of festivals, including Cuirt, and to the animation courses of Limerick College of Art and Design, Colaiste Dhulaigh and Ballyfermot College of Further Ed and various festivals countrywide, in libraries and privately. 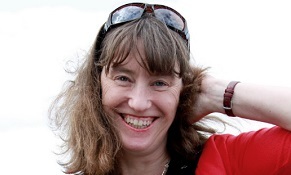 As a practitioner, Lindsay’s first TV commissions were in 1990 (Fair City and Scratch Saturday), and started working full time as a screenwriter in 1998, halfway through her MA in Screenwriting in Leeds Met – with ‘Punky’ being her best known series). She works across genre and form, including interactive narrative for games. Lindsay "If you have an idea for a script, this is the book designed to help you get it down on the page. There is all the theory you need, with examples to demonstrate (using film refs but often demonstrating through invented scenarios to show the possibilities) as well as exercises throughout, (tested on students over the years!) to stimulate the imagination but also to get you writing your script piece by piece. In terms of subject content, it moves from helping you work out what you need in an idea that will work on screen to creating and developing character, from structure to the individual scene and everything in between." “I don’t disguise how difficult and demanding a medium it is but neither can I hide the fun and excitement of writing that character or scene that jumps off the page. Not to mention finishing your first script! Especially since you can’t write your second until you write your first. But it is, of course, up to you whether you finish - all I can say is you will feel fantastic when you have! "What Lindsay has done wonderfully well in this book is to give screenwriters a helpful and practical guide to fire imaginations and to get words flowing onto the page. It’s full of advice, filled with insightful examples and bursting with practical exercises that will have you finishing your screenplays with confidence and creativity. It’s the how-to book that inspires as much as it teaches and enlightens. She has distilled the essence of screenplay craft and technique and turned it into a practical guidebook that’ll motivate you to overcome the screenwriter’s hardest obstacle – the first draft." – Alan Fitzpatrick, MD Filmbase. "Written with great passion for and insight into the craft of screenwriting, 'Write that Script! And write it now', is an inspirational, practical and detailed manual on how to write your first screenplay - but also one that will help you write any screenplay. Reading it gave me a strong urge to apply everything that is recommended in the book to the next screenplay I write. Lindsay's guidance is clear, helpful and fun and it's backed up by numerous filmic references which she analyses expertly. Her writing exercises will build confidence and craft. Lindsay was my first screenwriting teacher way back in 1996 and set me on my way to becoming a professional screeenwriter. It is a delight to see all her knowledge, experience and enthusiasm distilled into a book that will add richly to the education of screenwriters everywhere." - Christian O’Reilly, screenwriter.